Audi's Q5 compact luxury SUV for 2014 is cloaked in the company's signature styling - subtle, yet seemingly timeless. A comfortable ride and excellent handling are bolstered by quattro all-wheel drive and a choice of engines, including a TDI clean diesel. A new supercharged 3.0-liter V6 debuts in the SQ5, the first performance model in the Q5 lineup. 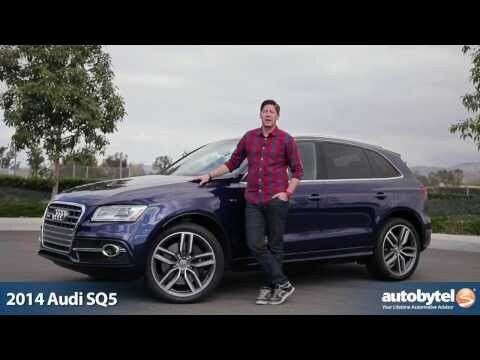 Why I like the original Audi sq5. I love my Audi. So much that I will not trade it in on the newest model because I do not like the updates that have been done to the model. My sq5 has a heated/cooled cup holder and that is no longer available and they have moved in the in-dash navigation and information panel out onto an Ipad like looking thing which I do not care for. My Audi is easy to drive, peppy with quick response to the gas pedal and attractive to look at. I haven't found any other vehicle that I like nearly as much as this vehicle for the price I paid for it. I would like to have more color and interior color choices though. Audi has limited options when ordering vehicles. It drives like a sports car and offers the flexibility of a small SUV. Take the Q5, add a performance-tuned suspension and a 354-hp turbo 3.0-liter V-6, and you get the SQ5. An eight-speed automatic is standard, as is all-wheel drive; in our testing, we hit 60 mph in 5.1 seconds. Apple CarPlay, Android Auto, a panoramic sunroof, 20-inch wheels, and leather and faux suede sport seats are just the tip of the luxury iceberg. The 7.0-inch infotainment screen can be upgraded to an 8.3-inch unit, and a 12.3-inch digital gauge display is also available. I love this vehicle! Perfect mix of high performance, luxurious, and comfort. I love this vehicle! I've never experienced any problems since owning it. Although it is a 2014, it does not feel dated. Very luxurious, comfortable, reliable. It surprises people how fast and sporty it is for being a small SUV. 2014 Audi SQ5 Review-New King Of Small Performance Crossovers? Volkswagen Group of America, Inc. (Volkswagen) is recalling certain model year 2014-2015 Audi SQ5 vehicles manufactured May 22, 2013, to April 14, 2015. The affected vehicles have an electric power steering assist system that may shut down in cold temperatures due to a steering motor sensor fault. Volkswagen will notify owners, and dealers will update the power steering control module software, free of charge. The recall began on July 31, 2015. Owners may contact Audi customer service at 1-800-253-2834. Volkswagen's number for this recall is 48M1.